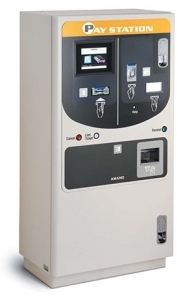 The AMG-7800 automatic Central Pay Station is designed as a fast pay-processing unit and is perfect for large-scale 24-hour operations. Transactions are fast and easy for the user virtually eliminating long lines and delays. 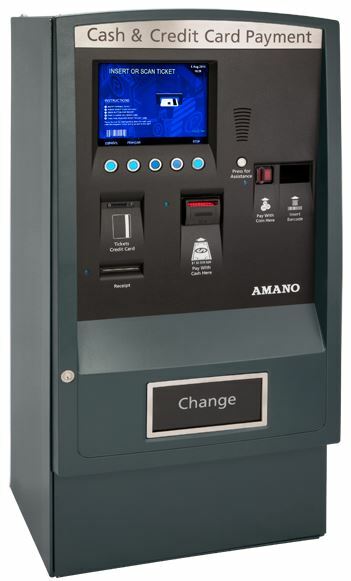 The Amano AGP-6800 Series pay station is finding wide acceptance in fully unattended facilities – revenue climb while labor costs are virtually non-existent. Unattended exit payment system calculates variable rate or flat rate fees utilizing mag-stripe technology. Provides an economical method to offer additional payment locations in the exit lanes of a facility. Includes a lighted patron guidance system and easy to read touch screen display. Electronic shutter system protects the ticket slot, coin slot, and note slot; activated open by the start of a transaction. Accepts entry tickets, exit tickets processed at a central pay location; cancelled tickets, lost tickets, validation coupons and service tickets.